Minecraft clones are all the range on the App Store – there must be hundreds of them, and while some are reasonably good, most are poor. There are plenty of apps related to Minecraft, too. Some are guides, others offer the lure of skins or custom maps and some offer very little at all. If you were to quickly glance at the Createrria page on the App Store you might think it just another Minecraft related app, as the icon is very reminiscent of Steve and the first few screenshots seem to show a 2D Minecraft that you can share with friends. But Createrria is actually more than that, and it’s a shame it has to hide its potential behind the similarities it bears to Mojang’s mega-hit. Createrria’s main focus is on creating your own games, but really it’s just a simple level editor with a few preset options. The editor itself is insanely easy to use: items can be dragged into position and easily re-sized, while terrain can simply be drawn by dragging your finger around the screen; it certainly isn’t a difficult system to learn. Included in the editor are a number of items that can be used in your “games”, such as portals, lifts, crates and a whole load of other things that you would expect to see in even the most generic platformer. 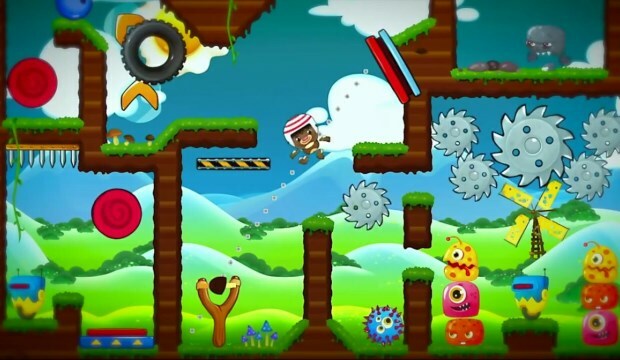 Along with traditional platformer items there are a lot of items that look to have come straight out of Angry Birds, like a catapult that fires monkeys, glass pillars and wooden planks (to name a few). Also included are four art styles to choose form, which is where a lot of the comparisons to Minecraft come in – although one of them does look like it would fit into a level from FEZ. The option to copy Angry Birds is made clear in the customisable preset layouts; two of the eight available layouts are slingshot levels, which basically turns the app into an Angry Birds level creator. The other layouts are more useful, even though they are all platformer based, as they give you a basic framework to edit as you please – but creating a game from scratch is the most rewarding way to go. Unfortunately as the preset layouts suggest, it is nigh on impossible to create anything other than a platformer or an Angry Birds clone, or maybe if you’re feeling really adventurous you could combine the two. In my entire time with the app I only saw one level that wasn’t either of these and that was a level where someone had made a vehicle (read: a square with wheels) that went in a straight line and crushed some monsters. To the new player the creation part of the app can be quite daunting, so starting with the creation challenges is the best option. These challenges give you a pre-created level that is missing a few key items; it is up to you to place these items in the correct position in order to figure out the route to the end of the level. 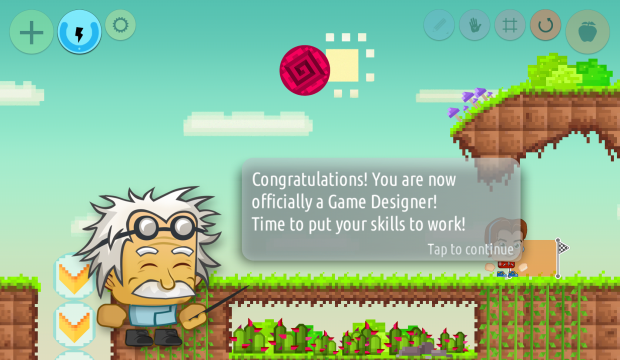 Some of the challenges, mainly the latter ones, are quite taxing, and it becomes quite an entertaining puzzle game while it teaches the basics of level creation. Personally, I found trying to solve some the creation challenges more enjoyable than many of the featured player-created levels. Once you’ve created your masterpiece you can publish it for others to play, and then you can play the creations of others. Many of the most popular levels are recreations of Mario stages, or ones that have massively detailed images, such as giant robots. The majority of the levels are not difficult but this is perhaps down to the simple controls, which allow you to move your character to the left and right and jump, and that’s it. The recreated classic levels are definately the most challenging but none are too difficult. VERDICT: The creation options are somewhat limited, but that doesn’t mean some interesting things can’t be done, and I’m sure the community will figure out some new ways to use the tools available. For anyone who isn’t the creative type the creation challenges will be the highlight, as the player-created levels so far aren’t a real challenge. 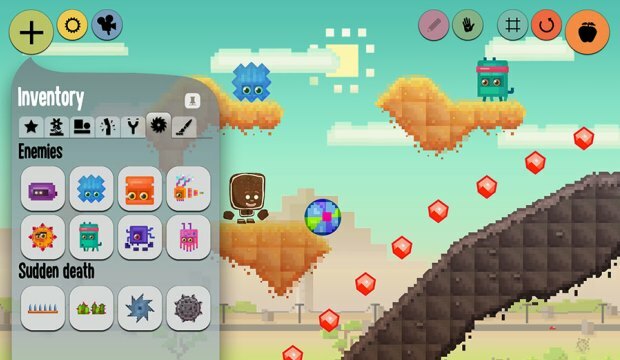 Createrria ultimately fails in its attempt to allow you to create games; instead it is at best a glorified level editor for retro platformers and Angry Birds clones. Those who stick with it may eventually build something great, but the majority will drop out after a few hours at most.